For years, it's remained an open question: What effects do dietary supplements such as high doses of vitamin D or omega-3 fatty acids derived from fish oil have on the risk of diseases such as heart attack, stroke and cancer? While there have been hints along the way, until now, no randomized clinical trial of a general population, especially a racially diverse population, has been large enough to adequately address these questions. 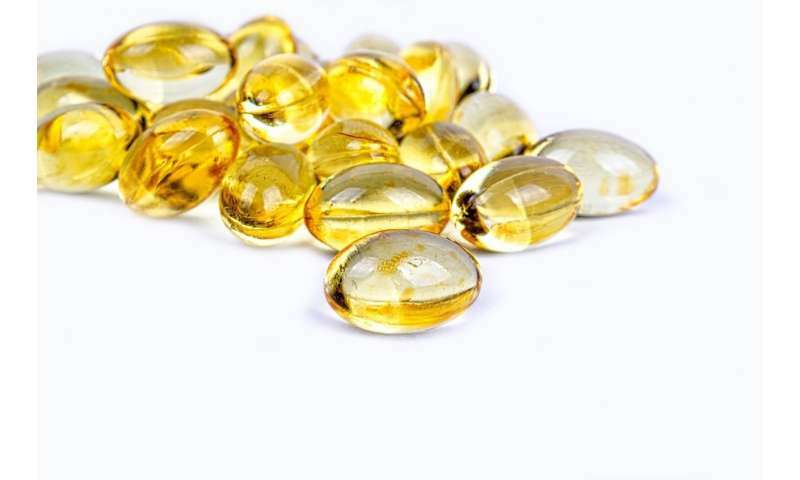 Brigham and Women's Hospital investigators leading the VITamin D and OmegA-3 TriaL (VITAL) conducted a rigorous placebo-controlled trial over the course of 5.3 years, gleaning a treasure trove of information on the effects of both supplements. The team found that omega-3 fish oil reduced heart attack rates but did not affect risk of stroke or cancer. In addition, vitamin D did not significantly affect heart attack, stroke or cancer incidence but was associated with a decrease in cancer deaths that started one to two years after participants began treatment. Results from VITAL were presented by JoAnn Manson, MD, DrPH, chief of the Division of Preventive Medicine at the Brigham, at the American Heart Association Scientific Sessions 2018, and published simultaneously in the New England Journal of Medicine. "VITAL is one of only a few randomized trials that has had a diverse study population, and African Americans have not been well studied in previous trials of omega-3 supplements. We found that omega-3 supplements were associated with a dramatic reduction in risk of heart attacks among African Americans in our study. If this finding is confirmed and replicated, it may point to a very promising approach to reducing coronary risk among African Americans," said Manson. "We found that omega-3s were associated with a reduction in risk of heart attacks across our study population, especially among participants who had lower than average fish intake (less than 1 1/2 servings per week). In addition, VITAL results showed that with time, vitamin D supplements may lower risk of cancer death. We plan to follow these participants for the next several years to see if this signal becomes stronger." VITAL was designed to test the independent effects of vitamin D and omega-3 supplements, as well as to test for synergy between the two. Participants were divided into four groups: vitamin D (2000 IU/day of vitamin D? [cholecalciferol]) plus omega-3s (1g/day of Omacor [known as Lovaza in the U.S.]); vitamin D plus placebo omega-3s; omega-3s plus placebo vitamin D; and placebos for both. Researchers compared those who received active omega-3s with those who received placebo. After a median of five years of treatment, 805 participants had suffered a major adverse cardiovascular event, such as a heart attack or stroke (386 in the omega-3 group and 419 in the placebo group). While these rates did not statistically differ, VITAL found a significant 28 percent reduction in risk of heart attack among participants taking the omega-3 fatty acid supplements (145 cases in the omega-3 group and 200 in the placebo group). This effect was greater among people who had lower fish intake (a 40 percent reduction). No significant differences were seen for cancer outcomes. The research team also examined the effect of vitamin D on cancer rates. A total of 1,617 participants were diagnosed with cancer by the end of the study; 793 had been taking vitamin D and 824 had been taking the placebo—a non-significant difference. Rates of specific forms of cancer—including breast, prostate and colorectal cancer—did not differ significantly between groups. However, when the team examined rates after participants had been taking supplements for at least two years, they found that cancer deaths were significantly reduced by 25 percent among those taking vitamin D. No differences were seen for cardiovascular outcomes with vitamin D.
No serious side effects, such as bleeding, high blood calcium levels, or gastrointestinal symptoms were found with either supplement. The two supplements did not appear to interact with each other or have synergistic effects. In addition to cardiovascular disease and cancer outcomes, VITAL will report on the effects of vitamin D and omega-3s on rates of diabetes, cognitive function, autoimmune disease, respiratory infections, depression and more in the months ahead. "Over the next six months, we will have even more results to share that may help clinicians and patients understand the benefits and risks of taking omega-3 and vitamin D supplements," said Manson. "Medical and public health authorities may look at the study results and decide if clinical guidelines should be updated. In the meantime, if you're already taking one or both of these supplements, there's no clear reason to stop. If you want to consider starting, our recommendation is to talk with your health care provider, but this does not need to be done on an urgent basis."